Firstly preheat oven to 200C / 400C / gas 6. Place the margarine or butter into a saucepan with the 200ml of cold water and bring to the boil. Remove the saucepan from the heat and tip in all of the plain flour immediately, beat thoroughly with a wooden spoon until the mixture is nice and smooth. Gradually beat in the eggs. Cover 3 baking trays with parchment paper. Using a medium nozzle, pipe walnut-sized balls on to the trays until all the mixture is used up. Bake in the oven on the middle shelf for 25-30 minutes until crisp. Make a slit in the side of each profiterole to release the steam. Then leave to cool on a wire rack. To make the chocolate sauce, put the sugar, chocolate and water into a saucepan, heat gently stirring until all ingredients are dissolved. Bring to the boil then simmer for around 10 - 15 minutes until a thick pouring consistency. Stir in the butter, remove from heat and leave to cool. Whip the double cream until stiff and fill profiteroles either with a piping bag or a small spoon. 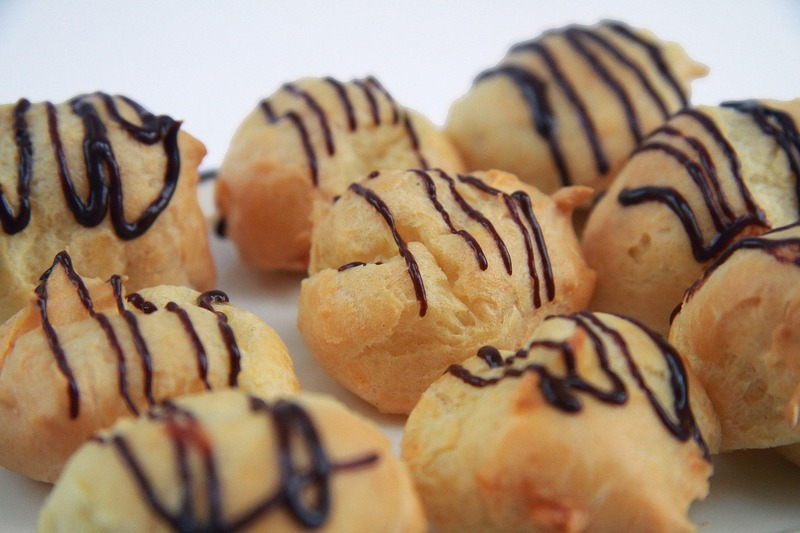 Arrange the profiteroles on a serving dish and drizzle over half of the sauce. Serve the remaining sauce separately for those who wish to have more.